Let’s face it- you’re not going to be spending much time basking in your garden in winter unless you’re a husky or a penguin. But that doesn’t mean it has to become a dull, bleak, frosty landscape. By choosing your plants and accessories wisely, you can keep your outdoor space vibrant and refreshing during the colder months, even if you do only get to enjoy the view from the comfort of your warm home. Aim for splashes of colour when selecting your winter plants and shrubs. 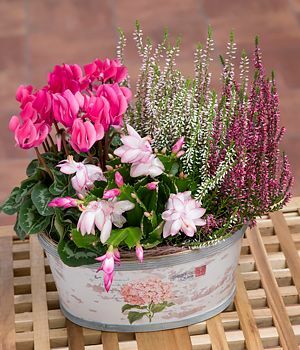 Choose flowers that do well in planters and tubs, as they can be moved easily to take advantage of light and heat conditions. Intersperse your flowers with foliage for a striking display. Autumn is nature’s time to plant so get to work in September. If you plan correctly, you will reap the blooming rewards the whole way from autumn through to early spring. Winter flowering pansies and violas are favourites, as are primroses and cyclamen. Ideal shrubs include varieties of vibernum, pernettya, heather, aucuba, and of course holly and Christmas berry for the seasonal flair. A constant stream of feathered visitors is a great way to keep your garden lively so at the very least, ensure that you have a few well-stocked feeders to keep them in action. If you’re feeling more adventurous, you could build your own feature feeding station. It can be as simple as painting some aluminium cans and attaching them to a fence or as complicated as a custom built bird feeder in the shape of a bird. 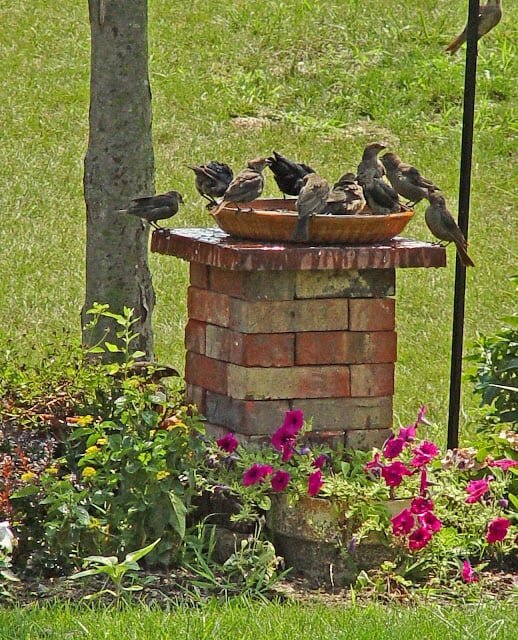 You could even add a little water table so that you can enjoy watching the little birds frolicking as they bathe and drink. Have fun with it! Indulge your imagination and rescue your garden from the winter blues with a fairy garden. The brilliant thing about fairy gardens is that they can be added to whenever you have the time. Start small with 2 or 3 stacked planters. Inexpensive accessories are available in your local home and garden store although if you have kids, recruiting them to help craft some bits and pieces can be half the fun. Lollipop sticks, pebbles and buttons are ideal fairy-making materials. 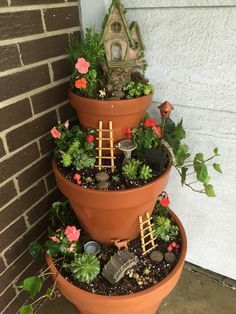 Keep going until your fairy garden has become a whole fairy village! Add some outdoor fairy lights for true authenticity. Some strategically places lights set to a timer can make a huge difference to your garden landscape once the long dark evenings set in. Garden spotlights and ground lights are perfect for illuminating your garden from the ground up, as well as showcasing your favourite garden aspects at night. Post and pillar lighting have a more subtle effect but they serve as wonderful decorative objects in their own right. 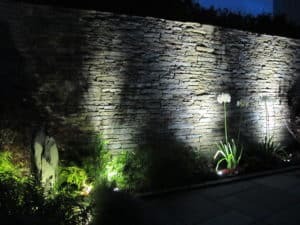 Modern garden wall lighting offers some interesting options outside of the traditional garden light forms. So, as you can see, winter doesn’t have to spell the end to a cheerful enjoyable garden. All it takes is some inspiration and creativity!